Antidepressant drugs can cause violent behavior. That’s what mainstream press such as the LA Times and Reuters are reporting, based on a new study published in a respected medical journal, PLOS Medicine, which found young adults between the ages of 15-24, were nearly fifty percent more likely to be convicted of a homicide, assault, robbery arson, kidnapping, sexual offense and other violent crime when taking the antidepressant than when they weren’t taking the psychiatric drug. To have heavy-hitters like the Los Angeles Times cover the issue is precedent setting, as the link between psychiatric drugs and violence has long been ignored by mainstream press. But the fact that antidepressants cause violence isn’t a new revelation as the Citizens Commission on Human Rights (CCHR) has been at the forefront of exposing this connection for nearly two decades. CCHR’s efforts to expose the link between violence and antidepressants goes back to 1991 when CCHR helped organize hearings before the Food and Drug Administration (FDA), where victims and experts gathered to testify that Selective Serotonin Reuptake Inhibitors (SSRIs) cause not only suicide but violence, including homicide. The testimony by parents, about the violent self-inflicted deaths of their young children, was gut-wrenching. Yet, despite overwhelming data provided by experts, and the first-hand accounts of suicide and violence caused by antidepressants, the FDA Advisory Committee, many of which had financial conflicts of interest with the pharmaceutical companies, refused to warn the public of the link between suicide and antidepressants, and did not provide any consideration of whether the antidepressants may be responsible for other violent behavior. 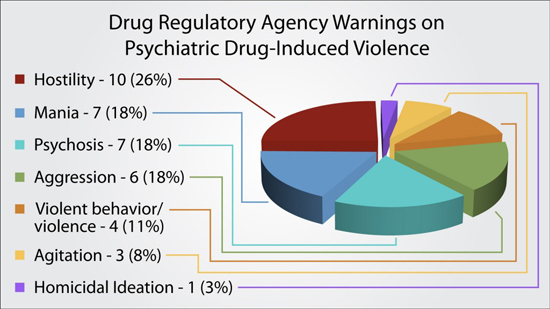 There have been 22 international drug regulatory agency warnings issued on psychiatric drugs causing violence. Click on graph to view larger. But, as was expected, increasing numbers of suicides and other violent acts continued to add up and, finally, more than a decade later, in 2004, the FDA was, again, forced to address the issue. This time, though, the data provided by whistleblowers within the industry could not be shrugged off and more than a decade after the federal agency first knew of the deadly consequences associated with SSRIs, a “black box” warning for suicidal ideation and behavior finally was issued on all antidepressants. Yet the connection to violence and homicide continued to be ignored. To this day, despite 22 warnings on psychiatric drugs causing violence from international drug regulatory agencies, and despite the fact that t least 35 school shootings and/or school-related acts of violence have been committed by those taking or withdrawing from psychiatric drugs resulting in 169 wounded and 79 killed, the FDA has never issued black box warnings on antidepressant drugs causing violence. For nearly two decades, CCHR has taken the lead on calling for toxicology reports of school shooters to be made public so psychiatric drug information may be collected and identified as a possible cause of the violent behavior. It is CCHR that has provided numerous white papers to lawmakers, both at the state and federal level and, for decades, CCHR has met with Congressional lawmakers, exposing the link between violence and school shooters and other acts of mass violence. 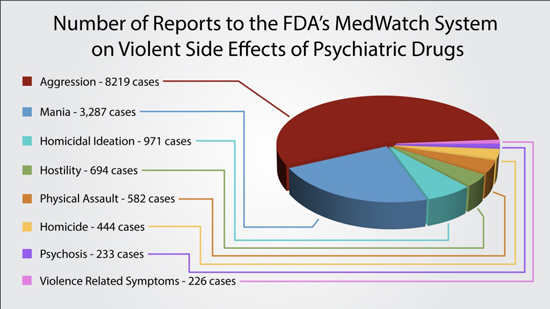 Between 2004 and 2012, there have been 14,773 reports to the U.S. FDA’s MedWatch system on psychiatric drugs causing violent side effects. Click image for more information. 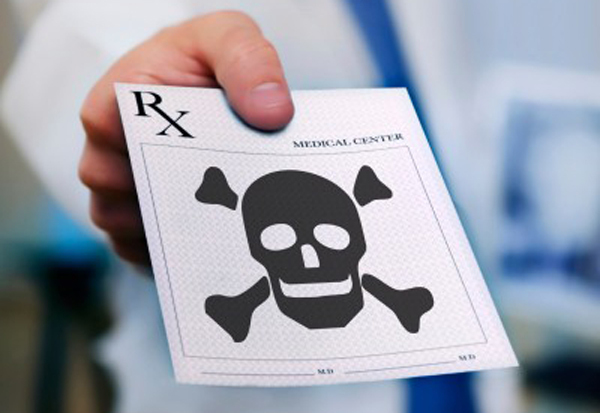 This latest study, linking violence and antidepressants, only serves to support decades of CCHR’s research and efforts to elicit action by those in a position to make a difference. To date, 35 school shootings and/or school-related acts of violence have been committed by those taking or withdrawing from psychiatric drugs and, between 2004 and 2012, there have been nearly 15,000 reports to the FDA’s MedWatch system on psychiatric drugs causing violent side effects. Coincidentally, the study linking antidepressants with violent behavior comes on the heels of another recent report exposing the fraudulent research of GlaxoSmithKline’s antidepressant, Paxil. According to a review of the data used for the approval of the antidepressant, Paxil is not effective in the treatment of children and there is significant risk of suicide associated with it. This is all important information that CCHR has been providing the public, media and lawmakers for decades—psychiatric drugs are ineffective and cause violent behavior. On the upside, though, given the media’s apparent new willingness to report on the dangers associated with psychiatric drugs and pharmaceutical fraud, there’s no telling how quickly the story could turn to the real issue… the fraud of psychiatric diagnosing. CCHR already has it covered.